Director/Screenplay – Brad Bird, Producer – John Walker, Photography – Andrew Jimenez, Patrick Lin & Janet Lucroy, Music – Michael Giacchino, Animation Directors – Alan Barillaro, Tony Fucile & Steven Clay Hunter, Supervising Technical Director – Rick Sayre, Production Design – Lou Romano. Production Company – Pixar Animation Studio. Bob Parr operates as the masked superhero Mr Incredible. In their mutual secret identities, he and Elastgirl marry. Shortly after, Mr Incredible is subject to a lawsuit by a man who claims injury as a result of being rescued by him. This leads to a deluge of lawsuits against superheroes. The government responds by passing a law that requires all superheroes to return to their civilian alter egos. Fifteen years later, Bob and Helen (Elastigirl) have had three children – Violet, who can become invisible and project forcefields; a son Dash, who can run at super-speeds; and the baby Jack-Jack. However, Bob is unhappy in his civilian job as an insurance claims clerk. He and his old friend Frozone yearn for the days of saving the world and even sneak out to monitor police band radios and go in in disguise to save people. Bob loses his cool at work and is fired. He is then contacted by the mysterious Mirage, who works for the government and hires Bob to take on several superheroic tasks. Bob feels reinvigorated as a result. This is in fact a devious scheme created by Buddy Pine, Mr Incredible’s former No. 1 fan, who desperately wanted to be his sidekick. Embittered by Bob’s rejection, Buddy has now reinvented himself as the super-villain Syndrome. As Bob is captured and Helen discovers what he has secretly been up to, she, joined by the kids, goes back into action to stop Syndrome. 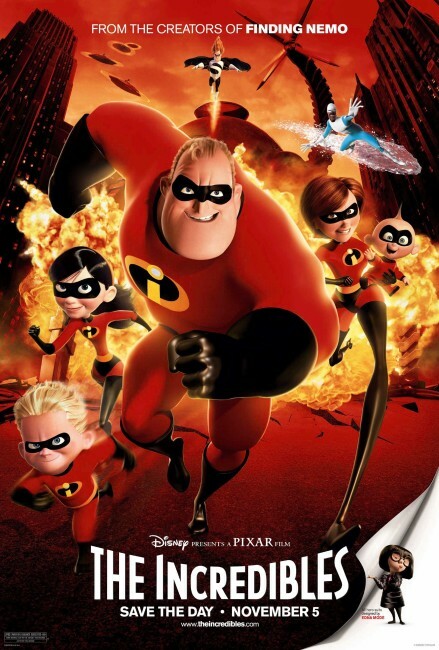 The Incredibles was the sixth animated film from Pixar and follows on the tail of successes such as Toy Story (1995), A Bug’s Life (1998), Monsters, Inc. (2001), Finding Nemo (2003), and was followed by the subsequent likes of Cars (2006), Wall-E (2008), Up (2009), Brave (2012), The Good Dinosaur (2015), Inside Out (2015) and Coco (2017), as well as sequels to many of these. The Incredibles marks the first opportunity when one of Pixar’s films has been made by an outside director, as opposed to someone who rose up through the ranks of the company. In this case, The Incredibles is the brainchild of Brad Bird. Brad Bird was, up until the success of The Incredibles, one of the great unsung names in American animation. Bird started out working for Steven Spielberg’s Amblin production company, where he made the famous Family Dog animated episode, which was the best ever episode of the Spielberg anthology tv series Amazing Stories (1985-6), and also co-wrote the script for the Spielberg-produced Batteries Not Included (1987). Bird then went onto become a director on tv’s The Simpsons (1989– ) and the all-embracing term of ‘executive consultant’ on The Simpsons and various other acclaimed animated series such as The Critic (1994-5) and King of the Hill (1997-2010). Brad Bird’s breakthrough though was with his first animated feature film, the excellent The Iron Giant (1999), which proved a box-office disappointment despite receiving universal rave reviews. Subsequently, Bird would go onto make Ratatouille (2007) for Pixar and then made his live-action directorial debut with Mission: Impossible – Ghost Protocol (2011), followed by Tomorrowland (2015). The Incredibles is a superhero spoof. The superhero spoof has a lengthy tradition on the screen, ranging back to tv series such as Batman (1966-8), Captain Nice (1967) and Mr Terrific (1967). We had seen the variable likes of Hero at Large (1980), tv’s The Greatest American Hero (1980-2), Blankman (1994), Orgazmo (1997) and Mystery Men (1999), along with occasional gems like the underrated The Return of Captain Invincible (1983) and the positively hilarious animated tv series The Tick (1994-6), which still remains the best of the bunch. (That’s the animated The Tick, not the live-action The Tick [2001-2], which tried to turn the idea into a lame spinoff of Seinfeld [1990-8]). In fact, The Incredibles bears more than a few resemblances to Captain Invincible – both have a mock-1950s newsreel opening that shows the US Government forcing superheroes into retirement, while the body of the film concerns the comedic attempts of a superhero to get back into shape. Brad Bird’s amusing idea is to chart out the ordinary family life of a superhero. It is a premise that has an endless degree of potential – one could easily see the film’s premise lending itself to a tv series. Bird gets much out of the contrast between the two extremes – with the highly amusing scenes of Bob’s bulky superhero forced to champ on the bit and work as an insurance clerk; he and his old colleague sneaking out to do a little covert world saving while pretending he is going bowling; the parents on the sideline at the athletics track cheering their son on to only take second place. (As well as the wonderful little trailer that went out prior to the release of The Incredibles that consisted of the side-splitting efforts of an out-of-shape Bob as he struggled to get back into his superhero suit, which alas does not appear in the film itself). Particularly amusing are some of Brad Bird’s little bits deconstructing superhero clichés – we encounter a fashion designer who specialises in costumes for superheroes (a show-stealing voice cameo from Bird himself) who has an hilarious speech about the dangers of adding capes to costumes; while Bob and Frozone complain about villains’ insistence on the need to monologue; and the character of Buddy has a witty scene as a wannabe sidekick in the first few minutes. The ultimate themes of The Incredibles – of learning to be oneself, of not hiding special abilities in a world that demands mediocrity, of a family unit discovering their togetherness – are familiar and the film is not saying anything new with them but only the most misanthropic of grinches is likely to disagree with the sheer exuberance with which Brad Bird makes his points. Most of all, Brad Bird creates a film that is an enormous amount of sheer good fun. There is a great deal of comic energy to The Incredibles, especially during the latter half when the family get into action zipping around the island and unleashing their powers. There are wonderful little comic bits packed in right throughout – The Incredibles needs a second viewing just to appreciate many of the gems – like Elastigirl’s habit of forming into a human parachute or a family combo using her as a sail and Dash as a human outboard motor. There is an especially hysterical set-piece with her taking on several heavies while trapped between two sets of doors. The voice casting is all top-notch. One failed to realise that Bob was voiced by Craig T. Nelson until the end credits. Craig T. Nelson appeared in films like Poltergeist (1982) and tv series such as Call to Glory (1984-5) and Coach (1989-97) but on screen (in live-action) mostly ends up coming across as a cross-eyed middle-aged man who is a little slow on the uptake. Here though, he is perfectly suited to the part. The scene-stealer, aside from Brad Bird’s cameo as Edna, proves to be Holly Hunter’s wonderfully feisty turn as Helen. Also of great note is the production design. As in The Iron Giant, Brad Bird demonstrates a love of bygone pop culture. The film feels like it is taking place in a world of Jet Age Retrofuturism – indeed, the same designs were also a schema of the same year’s big-screen remake of Thunderbirds (2004). Everything is designed in angular blocks of primary colour, while Syndrome’s isl and gadgetry is the perfect incarnation of a James Bond villain’s lair. Pixar, Brad Bird and most of the cast returned for a sequel Incredibles 2 (2018). (No. 3 on the SF, Horror & Fantasy Box-Office Top 10 of 2004 list).